Mutations in P0, the major protein of the myelin sheath in peripheral nerves, cause the inherited peripheral neuropathies Charcot-Marie-Tooth disease type 1B (CMT1B), Dejerine-Sottas syndrome (DSS) and congenital hypomyelination (CH). We reported earlier a de novo insertional mutation c.662_663GC (Ala221fs) in a DSS patient. The c.662_663GC insertion results in a frame shift mutation Ala221fs altering the C-terminal amino acid sequence. The adhesion-relevant intracellular RSTK domain is replaced by a sequence similar to Na+/K+ ATPase. To further clarify the molecular disease mechanisms in this sporadic patient we constructed wild type P0 and the c.662_663GC mutant expression cassettes by site-specific mutagenesis and transfected the constructs into insect cells (S2, High5). To trace the effects in live cells, green fluorescent protein (GFP) has been added to the carboxyterminus of the wild type and mutated P0 protein. In contrast to the membrane-localized wild type P0-GFP the Ala221fs P0-GFP protein was detectable almost only in the cytoplasm of the cells, and a complete loss of adhesion function was observed. The present study provides evidence that GFP is a versatile tool to trace in vivo effects of P0 and its mutations. Not only a loss of adhesion function as a result of the loss of the RSTK domain, but also altered intracellular trafficking indicated by a loss of membrane insertion are possible consequences of the Ala221fs mutation. In the peripheral nervous system, peripheral myelin protein 22 (PMP22), myelin protein zero (P0) and connexin 32 (Cx32/GJB1) are well-characterised transmembrane proteins expressed in Schwann cells. They function as adhesive or gap-junction proteins. In humans, mutations involving these 3 peripheral myelin genes and the gene encoding a transcription factor, early growth response 2 (EGR2) [1–3], have been associated with Charcot-Marie-Tooth disease (CMT) and several related inherited peripheral neuropathies. Several in vitro (cellular) and in vivo (rodent) models have been constructed to study the biology of PMP22, P0, Cx32 and EGR2 [2–6]. Eighty-three distinct mutations in the P0 gene located on chromosome 1q22-q23 are currently known [2, 3]. P0 mutations are usually associated with a typical CMT1 phenotype, characterised by severely reduced NCVs and signs of de- and remyelination on sural nerve biopsy [6, 7]. However, some P0 mutations lead to a more severe Dejerine Sottas Syndrome (DSS) phenotype or even congenital hypomyelination (CH) . Identical P0 mutations have been reported in association with either a CMT1 or a DSS phenotype [3, 7, 9]. Recently, P0 mutations have also been found in CMT2 patients, e. g. the Thr124Met mutation which was associated with highly variable NCVs, deafness, pupilary abnormalities and clusters of de- and remyelinating axons on peripheral nerve biopsy [10, 11]. One inherited frameshift mutation (c.306delA, Val102fs), probably leading to a loss-of-function allele, has been described . In this case, the parents were heterozygous for the Val102fs mutation and had a mild neuropathy, but their two children were homozygous for the same mutation and suffered from DSS. P0 encodes the most abundant protein of peripheral nervous system myelin, is localized in the compact myelin and contributes to the formation of the intraperiod and major dense lines [25, 26]. The structure of the extracellular domain of P0 resembles an immunoglobulin variable domain [12, 27–29]. This domain is important for the homotypic interactions that convey the self-adhesive properties that are essential to maintain myelin compaction and integrity [13, 25, 26]. During Schwann cell development, P0 is induced with genes encoding other myelin proteins such as PMP22, followed by myelin basic protein (MBP) and myelin associated glycoprotein (MAG) . The capacity of mutated P0 proteins to integrate into cellular membranes and to exert their function as an adhesion molecule has been studied in cellular models. These in vitro studies have been performed in CHO cells [13, 15, 28, 29], in S2 insect cells  which do usually not adhere in the wildtype condition, rat pheochromocytoma PC12 cells , L cells and HeLa cells . In suspension, transfected cells expressing normal P0 adhere to each other by homophilic interaction of the extracellular domains of P0 and also by association with apposing plasma membranes . We reported earlier a de novo insertional mutation (c.662_663GC, Ala221fs) for an affected male child in a family of German descent . To clarify the pathomechanism of the DSS patient with Ala221fs we studied the effects on the adhesion capability and intracellular trafficking of this mutation compared to the wildtype. Green fluorescent protein (GFP) is a helpful tool to observe cellular events in vivo. We report here both, altered intracellular trafficking and reduced adhesion of the mutant P0 in insect cells. We based the adhesion experiments on insect cells because, under well-defined cell culture conditions, the natural self adhesiveness of these cells can be minimized. The cell-cell adhesion of S2 cells before and after transfection or induction of the respective gene expression can be traced at the light microscope level (fig. 1). The relative cell-cell adhesion was compared with non-transfected cells. For tracing of the intracellular trafficking in live cells, green fluorescent protein (GFP) was included in frame to the C-terminus of wild type and Ala221fs P0 in the respective expression vectors, pEXII and pEXIV. After transfection, selection and induction of expression the P0-GFP signals of the Ala221fs mutation were predominantly localized in cytosolic vesicles and a membrane insertion was not visible by fluorescence microscopy (fig. 2). For the wild type P0-GFP fusion protein, cell surface insertion and strong cell-cell adhesion were observed (fig. 3). As a control, we cloned GFP alone into the pEXII vector and transfected this construct into the S2 cells. A GFP signal was not observed at the cell surface but in the cytosol and also in the nucleus (fig. 4). Fig. 5 shows three different microscopic levels of P0-GFP expressing S2 cells. All cellular layers, above, on and below the equivalent of a cell equator, show intracellular vesicles associated with P0-GFP fusion protein. As shown in Fig. 5B the cell surface insertion of the wild type variant is clearly visible, the Ala221fs mutation in fusion with GFP revealed only the P0-GFP associated vesicles (fig. 2). Light microscopy of S2 cells. In (A) the P0 transfected S2 cells are not induced to express protein and show only limited aggregation tendencies. In (B) the transfectants were induced with copperions and cell aggregates are clearly visible already 1-2 hours after induction. Pictures were taken at 10 x magnification. Fluorescence microscopy of a S2 cell transfected with the Ala221fs mutation in fusion with GFP (vector pEXII). None of the different layers analysed by fluorescence microscopy showed a membrane insertion of P0-GFP. 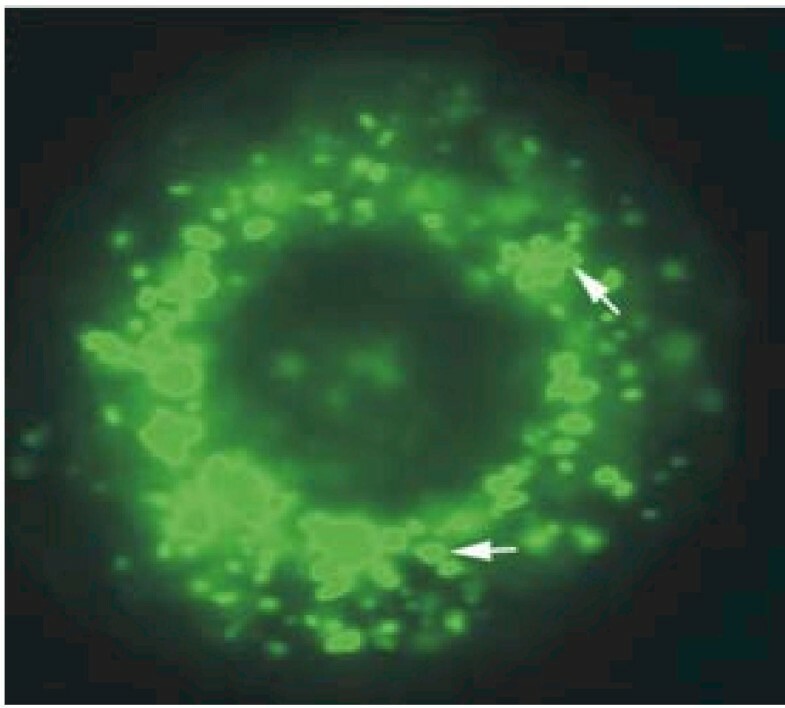 Fluorescent cytoplasmic vesicles (arrows) are clearly visible. The nucleus is free of fluorescence (see fig. 4). Aggregated insect cells after transfection with wild type P0/GFP fusion in vector pEXII. The fluorescent cell surface indicates the membrane incorporation of the wild type P0-GFP fusion protein which initiates the enhanced cell-cell agglutination. S2 cells transfected with GFP inserted in the pEXII expression vector. 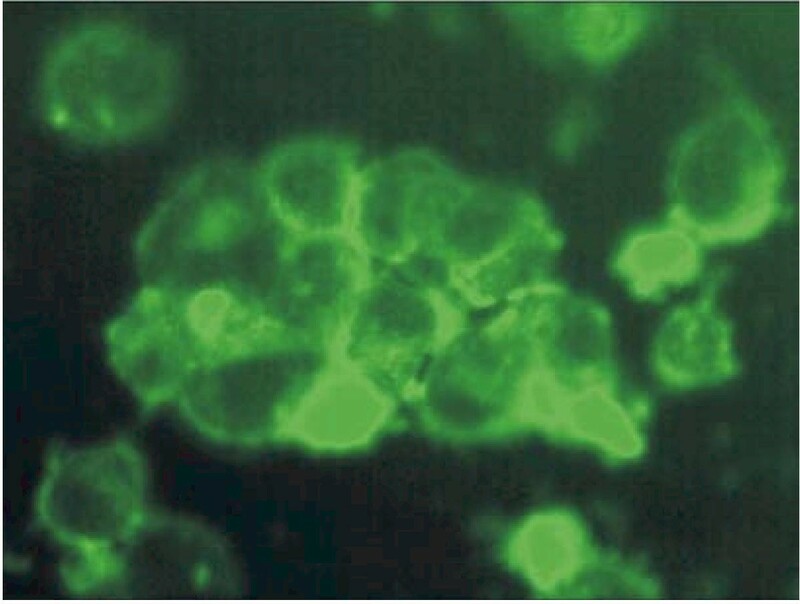 The overall staining of the cells expressing GFP only is clearly visible. Also the nucleus shows green fluorescence in contrast to the cells expressing wild type P0-GFP fusion protein (see fig. 2,5). Fluorescence microscopy of S2 cells expressing wild type P0/GFP in three different layers. In all layers, green vesicles are clearly visible in the cytoplasm. In (B) and (C) the equator of the cells is matched and the green fluorescence of the membrane is visible indicating the functional incorporation of wild type P0-GFP fusion proteins. Arrows indicate wild type P0-GFP in cytosolic vesicles and at the cell surface. The nuclei are free of fluorescence in contrast to the isolated GFP fluorescence (see fig. 4). Semiquantitative RT-PCR performed on S2 and High5 cells transfected with wild type and mutated P0-GFP constructs suggested that similar levels of RNA were present, when GAPDH was taken as an internal standard (Fig. 6). Semiquantitative determination of RNA in non transfected and transfected S2 and High5 insect cells by RT-PCR. The respective RT-PCR products derived from the different transfectants revealed the expected sizes as indicated by the positive controls: wild type P0, GFP, P0-GFP and GAPDH. The GAPDH products indicate similar RNA amounts for each experimental value. To analyze overall GFP fusion protein expression Western blots were performed to identify the respective proteins immunologically. 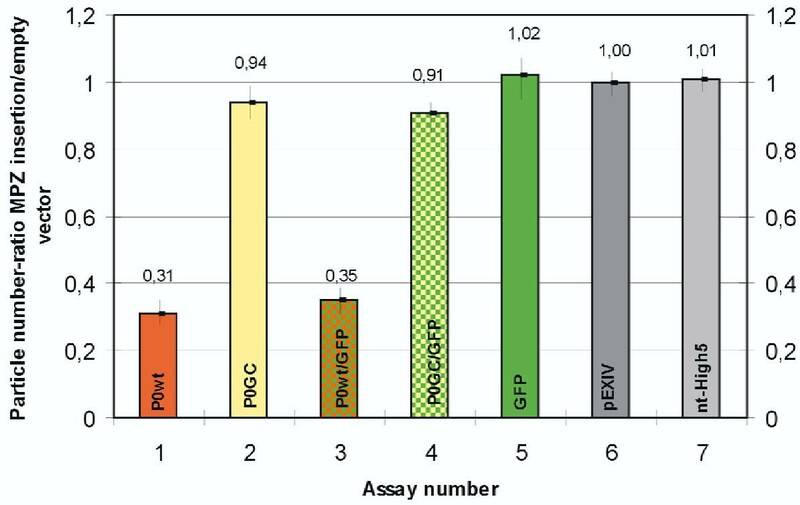 We constructed P0-GFP fusions as well as P0-V5 epitope fusions (vector pIB/V5-His) to obtain highly specific antibody detection of the P0 and P0-GFP expression in immunoblots. When the V5- epitope antibody was used clear single bands at the expected molecular weights of the respective proteins were seen in similar amounts (fig. 7). 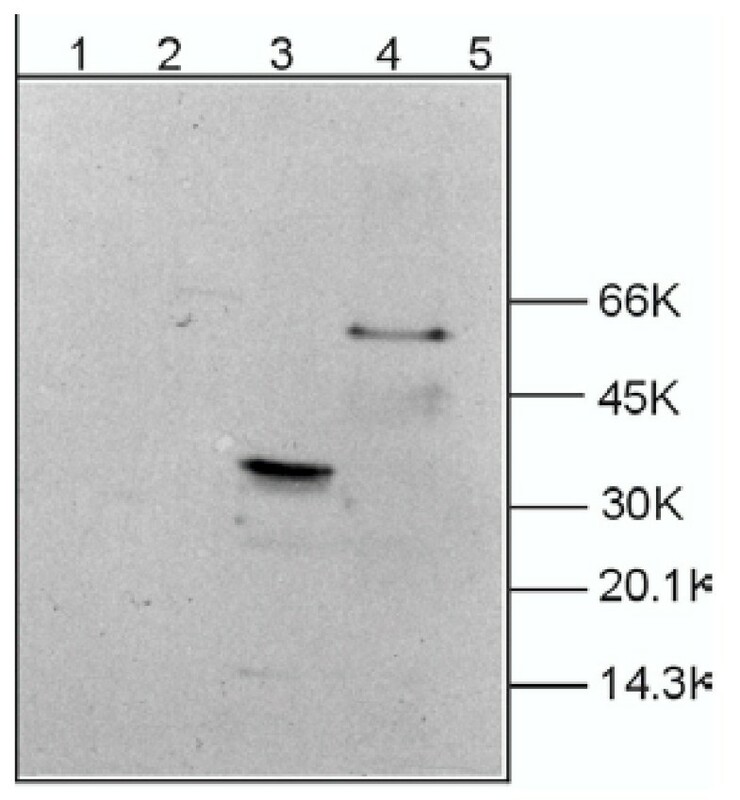 Western blot analysis of P0 protein levels with antibodies directed against the V5-epitope. The V5 epitope fused in-frame with P0 reveals expected molecular weights for GFP and GFP fused with P0 proteins.Lane 1: purified recombinant GFP.Lane 2: crude protein extract of sciatic nerve.Lane 3: protein extract of GFP-V5 transfected insect cells.Lane 4: protein extract of wild type P0-GFP-V5 transfected cells.Lane 5: moelcular weight standard. Finally, we performed an adhesion test with two types of insect cells (S2 and High5) for the Ala221fs mutation, P0 wild type in fusion with GFP, GFP alone, cells transfected with an empty vector and non-transfected cells. Both types of insect cells gave comparable results with all types of transfected DNAs. A loss of adhesion of the Ala221fs mutation compared to the P0 wild type is obvious (fig. 5, 8, 9). The remaining adhesion is as low as for untransfected and GFP alone transfected cells. The fusion of GFP with wild type P0 in both cell types has only slight or no influence on its adhesion function. Hence, it is now possible to visualize the P0 trafficking as well as the cellular effects of mutations in live cells. Adhesion assay with S2 cells transfected with wild type P0, mutated P0 (Ala221fs), wild type P0-GFP and mutated P0-GFP. Adhesion is seen with wild type P0 (indicated in the figure as P0wt) with and without GFP fusion. The negative controls, GFP alone, empty vector and non-transfected cells, as well as the Ala221fs mutation (indicated in the figure as P0GC) do not show adhesion. Adhesion assay with High5 cells transfected with wild type P0, mutated P0 (Ala221fs), wild type P0-GFP and mutated P0-GFP. Adhesion is seen with wild type P0 (indicated in the figure as P0wt) with and without GFP fusion. The negative controls, GFP alone, empty vector and non-transfected cells, as well as the Ala221fs mutation (indicated in the figure as P0GC) do not show adhesion. Here we present data on a P0 mutation with regard to its adhesion function. For our analysis, the P0 and GFP genes were fused at the carboxyterminus of P0. This fusion allows the observation of the intracellular trafficking of both, wild type and mutated P0 protein in live cells. As a first mutation we tested the Ala221fs variation which produces a completely altered carboxyterminal amino acid sequence with homologies to Na+/K+ ATPase . Recently, a systematic analysis of carboxyterminal P0 mutations was reported, showing that the RSTK motif is essential for adhesion . This motif is the target of PKC-mediated phosphorylation, and the lack of this phosphorylation motif hampers the adhesion function of P0. The Ala221fs mutation eliminates the RSTK motif, resulting in a complete loss of adhesion. Interestingly, a P0 protein truncated by 28 amino acids at the carboxyterminal end loses his adhesion function, although it is found at the cell surface . The Ala221fs mutation, however, results in a loss of cell surface insertion detectable under fluorescent microscopy conditions using the GFP fusion. A loss of adhesion function is therefore the consequence of impaired ability to reach the cell surface. It is conceivable that altered intracellular trafficking is responsible for additional mutational mechanisms. 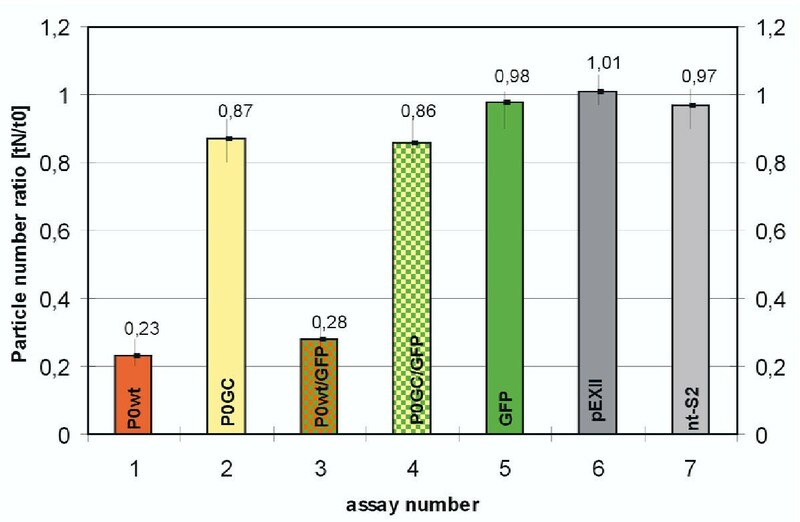 Earlier reports suggested a dominant-negative effect of truncated P0 proteins on the function of the wild type P0 , as seen in co-expression experiments with wild type P0 and P0 proteins truncated by 52 and 59 amino acids also eliminating the functionally important RSTK motif. These truncated proteins reached the cell surface in amounts comparable to the wild type, most likely resulting in disturbed protein-protein interaction and reducing adhesion was by 80%. In our experiments adhesion of Ala221fs transfected cells was reduced by almost 100 %. However, the overall effects of a co-expression of wild type and Ala221fs P0 mutation remain to be established. Preliminary co-expression experiments using wild type P0 and the Ala221fs mutation indicate that adhesion of the transfected cells is dramatically reduced (data not shown). Experiments are underway to perform a more detailed analysis of the relative expression levels and of the intracellular interactions of the transfected proteins. GFP in fusion with P0 has proven to be a versatile tool to visualize effects of pathogenic mutations in live cells. GFP expressed in frame does not hamper the adhesion function of the wild type P0. A combination of colors from different fluorescent proteins for wild type and mutated P0 will help to clarify the disturbed protein-protein interactions in vivo. This system provides the basis for deeper insights into the mutational effects via co-expression experiments of wild type P0 and mutations. The affected child showed signs of sensory loss and a markedly reduced nerve conduction velocity (NCV, 15 m/s) at age four years. The non consanguineous parents revealed no clinical symptoms of peripheral neuropathy and electrophysiological examination showed NCVs within the normal range. A sural nerve biopsy was not done . SSCP analysis revealed an aberrant pattern of bands for the affected child, not for the parents and not in a prenatal diagnosis performed on DNA derived from amniotic fluid, in exon 6 of P0. Direct sequencing revealed a GC insertion (c.662_663GC) initially identified as INS707GC mutation according to the P0 cDNA numbering of . The GC insertion alters the carboxyterminal amino acid sequence of the human P0 cDNA beginning at Alanin in position 221 creating homology to a conserved domain of Na+/K+ ATPase and loss of the PKC substrate motif (RSTK). The human wild type P0 cDNA was kindly provided by Prof. Hayasaka to perform the here presented experiments. Initially, a combination of vectors contributing alpha-amanitin resistance (pPC4) and heavy-metal inducible insect-specific promotor (pRmha3) had been used. To obtain stably expressing cell lines a vector comprising the expression cassette, a copia element for chromosomal integration, a neomycin resistance and the metallothionein inducible promotor was constructed and named pEXII. The High5 system (Invitrogen, Paisley, UK) was tested for transient P0 expression, too. The pIB/V5-His vector was modified in its polylinker and renamed to pEXIV. A quick and reliable method to introduce mutations by PCR was used as reported . To determine the transfection efficiency fluorescence in situ hybridisation (FISH) was used resulting in more than 90% of all cells with specific pPC4 and pRmha3-P0 fluorescence signals and indicating that highly effective transfection was possible . Transfection was performed using InsectinPlus (Invitrogen). One day before transfection the cells were transferred to 6-well plates and grown overnight at 25°C in the incubator. For both, S2 and HighV transfection, we used 3 μg plasmid DNA, 10 μl InsectinPlus and 500 μl of Insect cell medium. A 15 sec. mixing was followed by a 20 min incubation at 21°C. During this time the medium was removed from the 6-well plates with the cells located on the bottom of the wells. The transfection suspension was pipetted carefully onto the cells. After a 4 h incubation at 25°C, 1 ml medium was added. After 48 hours the medium was removed and 2 ml fresh medium was added. After two further days, the cells were transferred to cell culture bottles (25 ml) and supplied with antibiotics (2 mg/ml neomycin for pEXII/S2 cells; 8 mg/ml blasticidin for pEXIV/HighV). The cells were grown in suspensions, at 25°C and 100% humidity in an incubator. Drosophila-SFM or HighV-medium was used according to the manufacturers guidelines. S2-cells were fed at least once a week, the HighV-cells every 3–4 days. The cells in suspension were counted in Neubauer- or Fuchs-Rosenthal-chambers. Cells were collected by centrifugation at 400-600 x g for 10 min and washed once in 1 x PBS. After SDS-polyacrylamid gelelectrophoresis (15% gel) the proteins were transferred to a nitrocellulose membrane (Schleicher & Schüll, Keene, USA) using a Minitrans-Blot Eletrophoretic Transfer chamber (Biometra, Göttingen, Germany). The gel was equilibrated in transfer buffer (24.8 mM Tris-base, 192 mM glycin, 20% methanol, pH 8.3) for 20 min. The transfer membrane was first rinsed with water and then equilibrated with transfer buffer. The further transfer, blocking and washing steps were performed according to the manufacturer's (Biometra) instructions. To isolate RNA from the insect cells the mini-protocol of the RNEASY system (Quiagen, Hilden, Germany) was used. 5 × 106 to 1 × 107 cells were harvested at 400-600 x g for 10 min. The cDNA synthesis was performed using 5 μg RNA and the random hexanucleotide system from Boehringer Ingelheim. The subsequent PCR reactions were performed according to standard protocols. For detection of GAPDH the primers GAPDH-start 5'-GAC GCC TAC AGC CCC GAC – 3' and GAPDH-stop 5'-AAG ATC CAC AAC GGA GAC – 3' were used. For detection of PO the primers P0-ATG-NotI 5'-GCG AAT TCG CGC GGC CGC GCA TGG CTC CTG GGG CTC CCT CAT CCA – 3' and P0-TAG-NheI 5'-CGG CTA GCC TAT TTC TTA TCC TTG GGA GAC TCC C – 3' were used. For the detection of P0-GFP, fusion RNA the GFP-stop/NheI 5'-GCG CTA GCT TAT TTG TAT AGT TCA TCC ATG – 3' primer was used at the 3' end. An aliquot (1 ml) of the insect cell suspension was centrifuged at 400-600 x g for 2 min and resuspended in PBS. Drops of the cell suspension were transferred to microscopic slides. 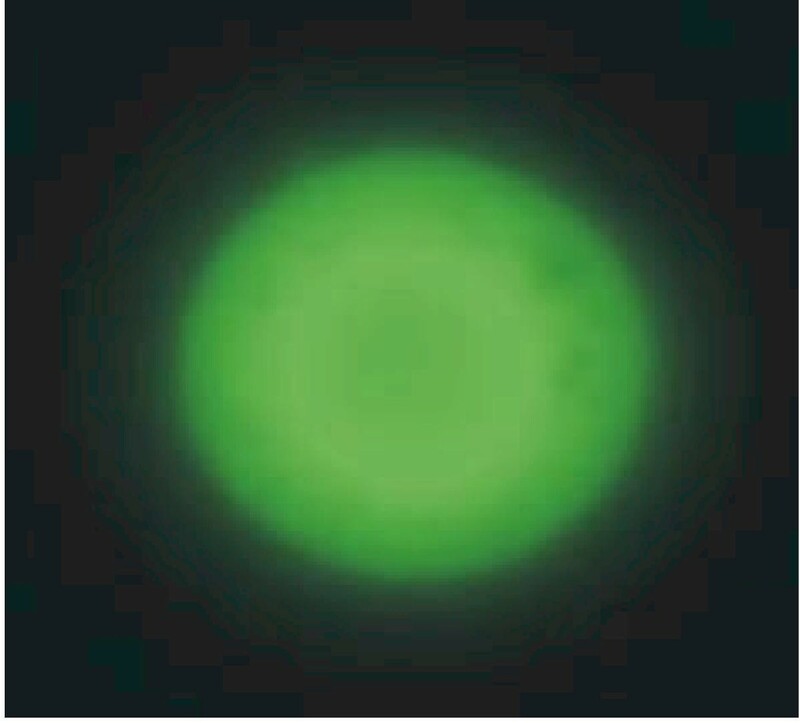 The evaluation of the green fluorescence of the cell suspensions was performed on a Zeiss Axioplan Microscope with ISIS imaging software and GFP fluorescent filter. To avoid measurement of adhesion of dead cells, a trypan blue staining  was performed and only cells which had not incorporated trypan blue were included to calculate the particle number ratios. An aliquot of 200 μl cell supsension was mixed with 200 μl trypan blue solution and left for 5 min at 21ºC. After 2 min centrifugation at 400-600 x g the supernatant was discarded and the pellet resuspended in PBS. This supspension was then examined on a microscopic slide. P0 expression in S2 cells was induced by copper ions overnight . An aliquot (1ml) of the insect cell suspension was centrifuged at 400-600 x g for 2 min and resuspended in PBS. Drops of these cells were transferred to microscopic slides and the Fuchs-Rosenthal chamber for calculation of the particle number per volume. The adhesion test was performed in a Fuchs-Rosenthal-chamber. We want to thank the DFG and Boehringer Ingelheim foundation for funding this work. EN was a Humboldt fellow in the laboratory of BR. AE constructed the P0-GFP fusion and performed the adhesion test. SO performed control experiments and preliminary co-transfection assays for wild type and mutated P0. CF established the cell culture conditions for lowest self-adhesion of insect cells. EN contributed to the vector construction. CVB participated in the study design and coordination. MS participated in the study design, provided S2 cells and vectors and performed a critical review of the manuscript. BR conceived and supervised the experiments and wrote the manuscript.